The chief suspect in last Thursday's Barcelona attack made his escape on foot to the outskirts of the city where he hijacked a car, Spanish police say. At a news briefing, they confirmed that Younes Abouyaaqoub, 22, was suspected of driving the van which ploughed into dozens of people, killing 13. CCTV footage in Spanish media appears to show him walking through a market district shortly after the attack. A manhunt has been extended across Europe and police say he may be armed. 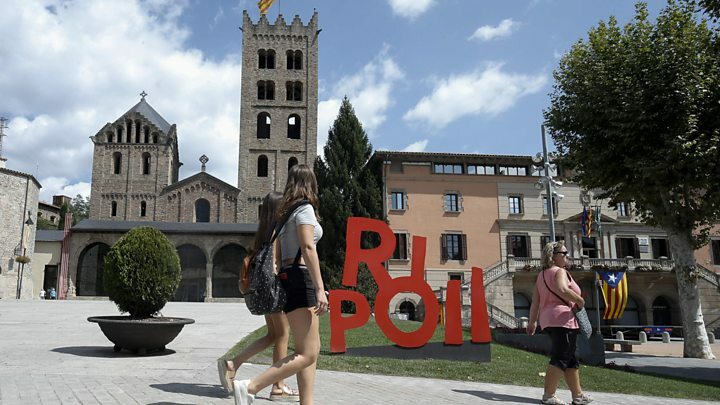 Some 90 minutes after mowing down dozens of people on the central Las Ramblas avenue, Abouyaaqoub fled to the city's university district, police say. Abouyaaqoub is alleged to have hijacked the car before driving it through a police checkpoint and later abandoning the vehicle. Police say he may have crossed into France. The male driver of the car, Pau Pérez, 34, from Vila Franca, was found stabbed to death in the back seat, becoming the 15th victim of the Barcelona bloodshed and a later attack in the resort of Cambrils. A woman died in Cambrils when a car was driven into pedestrians, and five suspected jihadists were killed at the scene by police. At a news conference on Monday, officials also revealed there were "strong indications" that an imam suspected of radicalising the young men who carried out the attacks had died in an explosion at a house in Alcanar, south of Barcelona, that was being used as a bomb factory. Images published by El Pais show Abouyaaqoub walking through La Boqueria market, wearing sunglasses, as he passes other people heading away from Las Ramblas. Police also released more images of Abouyaaqoub, and appealed for help in finding him. Catalan officials said on Monday that all 15 victims had now been identified and their families notified. 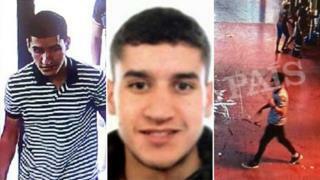 Police believe that Abouyaaqoub is the only one of the 12 suspects at large. In addition to the five killed in Cambrils, four others are under arrest. Two sets of human remains are yet to be identified from the house that blew up in Alcanar last Wednesday night. Spanish media outlets say Es Satty had spent some time in prison, and had met prisoners involved or linked with the 2004 Madrid train bombings in which 191 people died. He had also stayed in Belgium for some three months last year, where he had been searching for work, including in Vilvoorde, a small town of just 42,000 from which more than 20 jihadists departed for Syria in 2014. El Mundo said that one of those killed in Cambrils, Said Aallaa, had left a note in his room apologising for the harm he was about to cause. The group had apparently been planning three co-ordinated attacks using home-made bombs. Police found about 120 gas canisters at the Alcanar site. French media also report that the vehicle used in the Cambrils attack had been caught on speed cameras in France's Essonne region the previous week. But a direct link between the group of attackers in Spain and the car's appearance in France has not yet been established.